Villagers Celebrate The Historic US Supreme Court’s Verdict Which Ended The Immunity of the IFIs | Flickr - Photo Sharing! March 31, 2019, Mundra: The air in Mundra filled with the slogans like Kaun Banata Hai Hindustan, Machuawara, Majdoor, Kisan! (Who makes India? Fishermen, Labourer and Farmers); Ladenge Jeetenge! (We shall fight, we shall win); Aadiwaasi Machhuawara Kisaan Ekta Zindabad! (Long live the unity of tribals, fishermen and farmers), and Poonjipatiyon Ki Dalaai Band karo! 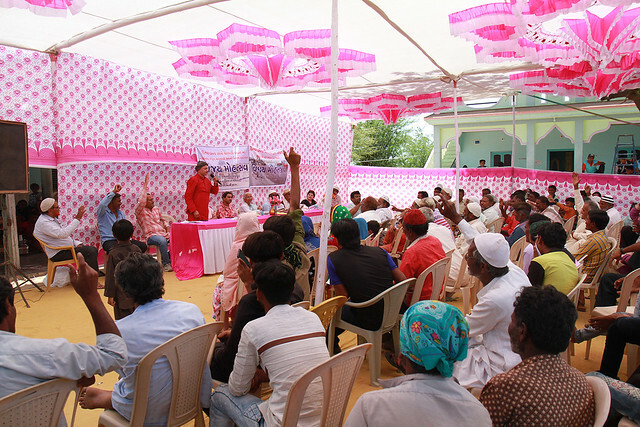 Hundreds of people from Navinal and Tagri villages of Kutch and representatives from various social movements and civil society members have gathered to celebrate the historic verdict of the US Supreme Court that ended the absolute immunity enjoyed for long by the International Financial Institutions. “Is Development only for Tata, Ambani, and Adani? What about the fishermen from Mundra, who live in the open with huts made up of bamboo and gunny bags but feed thousands of people in and outside Gujarat,” asked Medha Patkar, senior activist, Narmada Bachao Andolan and National Alliance for the Peoples’ Movements. “Every citizen has the constitutional right to question anti-people policies,” she asserted. She further said, “We do not have any problem in discharging Sardar Sarovar (Narmada) Dam waters for the benefit of the farmers of Kutch. However, we will fight if it is given to the industries,” referring to the allocation of water for a large number of industries. She was speaking at the public meeting, organised by the Machimar Adhikar Sangharsh Sangathan (MAAS), Mundra, which witnessed the participation of the hundreds of the villagers affected by the World Bank Group’s International Finance Corporation-funded Tata Mundra Ultra Mega Power Plant. The meeting was organised to celebrate the historic verdict of the US Supreme Court that ended the absolute immunity enjoyed for long by the International Financial Institutions. During the occasion, representatives from various social movements and civil society members like Medha Patkar, senior activist of the Narmada Bachao Andolan; Soumya Dutta, Convenor of the Beyond Copenhagen Collective; Nitaben Mahadev, Gujarat Lok Samiti, Sanjeev Danda, Dalit Adivasi Shakti Adhikaar Manch; and Maju Varghese and Anuradha Munshi from the Working Group on International Financial Institutions (WGonIFIs) were also present to extend their solidarity and felicitate the fishermen and villagers who have been at the forefront of this historic struggle. The petitioners of the case were garlanded and facilitated at the public meeting. Speakers after speakers alluded their courage, encountering hostilities and the broader impact of this victory to the people around the globe, making institutions like World Bank more accountable. Speaking at the occasion, Soumya Dutta, emphasised that the recent US Supreme Court’s decision to end immunity of the International Financial Institutions is a significant victory of the people fighting to save their dignity, land and livelihood across the world. He stressed that a broader alliance of different sections of the people affected by the project be formed to fight getting justice. Sanjeev Danda said the US Supreme Court’s verdict is a firm reminder that fishers and poor are not insects that can’t be eliminated easily. He thanked the villagers for their firm resistance against the might of the IFC and Tata. Nitaben Mahadev expressed solidarity on behalf of organisations in Gujarat and wished the people the best to take the fight to higher heights. On February 27, 2019, the Supreme Court of United States, in a historic 7-1 decision, the U.S. Supreme Court decided in Jam v. IFC that international organisations like the International Finance Corporation of the World Bank Group do not enjoy absolute immunity. The Court’s decision marks a defining moment for the IFC – the arm of the World Bank Group that lends to the private sector. For years, the IFC has operated as if it were “above the law,” at times pursuing reckless lending projects that inflicted serious human rights abuses on local communities, and then leaving the communities to fend for themselves. In the case of the Tata Mundra, since the beginning, the IFC recognised that the Tata Mundra coal-fired power plant is a high-risk project that could have significant adverse impacts on local communities and their environment. Despite knowing the risks, the IFC provided a critical Rs 1,800 crore (USD 450 million) loan in 2008, thus enabling the project’s construction. Despite this, the IFC failed to take reasonable steps to prevent the harms it predicted and failed to ensure that the project abided by the environmental and social safeguards. As predicted, the plant caused significant harm to the communities living in its shadow. Construction of the plant destroyed vital sources of water used for drinking and irrigation. Coal ash has contaminated crops and fish laid out to dry, air pollutants are at levels dangerous to human health, and there has already been a rise in respiratory problems. The enormous quantity of thermal pollution – hot water released from the plant – has destroyed the local marine environment and the fish populations that fishermen rely on to support their families. Although a 2015 law required all plants to install cooling towers to minimise thermal pollution by the end of 2017, the Tata plant has failed to do so. A nine-mile-long coal conveyor belt, which transports coal from the port to the Plant, runs next to local villages and near fishing grounds. Coal dust from the conveyor and fly ash from the plant frequently contaminate drying fish, reducing their value, damage agricultural production, and cover homes and property. The IFC’s own internal compliance mechanism, the Compliance Advisor Ombudsman (CAO), issued a scathing report in 2013 confirming that the IFC had failed to ensure the Tata Mundra project complied with the environmental and social conditions of the IFC’s loan at virtually every stage of the project. The report recommended the IFC to take remedial action. However, the IFC’s management responded to the CAO by rejecting most of its findings and ignoring others. In a follow-up report in early 2017, the CAO observed that the IFC remained out of compliance and had failed to take any meaningful steps to remedy the situation. The harms suffered by the people are all the more regrettable because the project made no economic sense from the beginning. In 2017, in fact, Tata Power began trying to unload a majority of its shares in the project for one rupee because of the losses it has suffered and will suffer in future. At the moment, the plant is operating much-below capacity in part because India has an oversupply of electricity. Please visit here for more background and accessing documents related to the case. Machimar Adhikar Sangharsh Sangathan (MAAS) is a trade union of the fish workers in Mundra and a co-petitioner in the historic Budha Jam vs IFC case.